The Venturi VBB-3 Electric Land Speed Record (LSR) car is the fastest, most powerful electric car today. Also known as The Buckeye Bullet, it is one of a series of student-built, alternative-fuel race cars created by Ohio State University students led by Dr. Giorgio Rizzoni at the Center for Automotive Research. Hewland has been designing and building electric drivetrains for more than 10 years providing the four-speed transmission for the inaugural Formula E season in partnership with McLaren as one example. The Venturi VBB-3 is the world’s most powerful electric vehicle with separate powertrains for each axle. Each powertrain has an electric motor driving a 2-speed transmission, built by Hewland. 1st gear can be used up to 275mph. Once second gear is selected, the car can run up to its maximum speed. “The amount of torque the motors put out—and how quickly they can do it—requires some special things from the transmission“ observes David Cooke, Team Leader, OSU. The target speed for the vehicle is 400+ mph. On 22 September 2016, driven by Roger Schroer, the Venturi VBB-3 clocked 358mph (576kph) during a land speed record attempt. It was slightly slower on the return leg delivering a two-way average of 341.1mph on the Bonneville Salt Flats; a new world record! While it is feasible to have an electric motor driving each wheel on a car, it’s generally accepted that this approach is costlier, weighs more and upsets the vehicle dynamics too much when compared to the alternatives. If you take a typical electric road car like the Tesla Model S. It uses a single motor coupled to a speed reduction transmission with a ratio of 9.73:1. This arrangement delivers very good performance. A dual-motor version is now available that replicates this arrangement at the front of the car. However, for a specialist application like trying to break the world land speed record for electric vehicles, a different approach is required. The team at OSU realised that a single reduction ratio would not do the job. They needed one ratio to enable the car to reach a high speed without depleting too much of the Li-Ion battery packs energy, and then a second one to accelerate the car to its theoretical maximum whilst keeping the electric motor operating within its optimum efficiency and power output range. The team decided on a two-motor arrangement, one on the front axle and one on the rear, each connected to a two-speed Hewland transmission. The driveline management system manages and synchronises the delivery of power from the two motors and ensures that the two gearboxes shift ratios in unison. The two custom electric motors are developed by Venturi Automobiles, and is powered by over two megawatts of lithium ion batteries produced by A123 Systems. The team continues to develop the car so look for more record-breaking performances in the future! 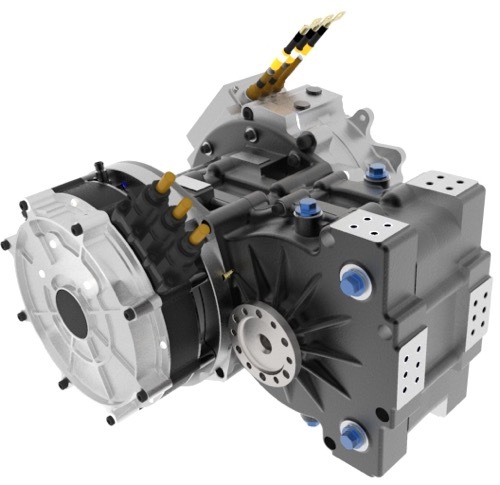 “The amount of torque the motors put out—and how quickly they can do it—requires some special things from the transmission“ observes David Cooke, Team Leader, OSU.